True Story: I really didn’t watch a lot of Mr. Roger’s growing up. Shot of Mom wasn’t a fan of the show, so she would change the channel after Sesame Street. However, I did catch some episodes at my grams. My favorite ever was the trip to the Crayola Factory to see how Crayons were made (thanks some random person I fanned on FB). Fast forward to 2003. After a long night (and morning) out celebrating my 22nd birthday mom calls to wish me a Happy Birthday and breaks the news that Mr. Rogers passed away on my birthday. This sent me into tears (and if you know me, you know I never cry). I blame it on the fact that I was still drunk. Today would have been Mr. Roger’s 85th birthday. While his show is still on, I suspect it isn’t as well-received by kids today as it once was. However, that isn’t stopping me from brainstorming some ways to host your own Mr. Rogers Neighborhood-themed party! · Attire: Cardigans are a MUST considering they were an essential part of Mr. Rogers signature style. If you are feeling ambitious, you can dress up as one of the characters from the show – Mr. McFeely (seen here with me earlier this year), King Friday, Queen Sara Saturday, Prince Tuesday and Queen Sara Saturday. You can find the official list of characters here. I can always make another owl costume! · Activities: I’m going to go a little crazy here, but you could rent a trolley (Molly’s Trolleys here in Pittsburgh) and make a yellow sign for it that says “Neighborhood Trolley.” Now this can go one of two ways: 1. This would be fun for kids to ride around the neighborhood in a trolley. OR 2. Trolley Parties are real popular in Chicago. Not just for bachelorette parties, but for a random Friday night. This would be PERFECT for a Mr. Rogers-themed adult party! Bring on the booze! The PBS store sells a mini trolley here. 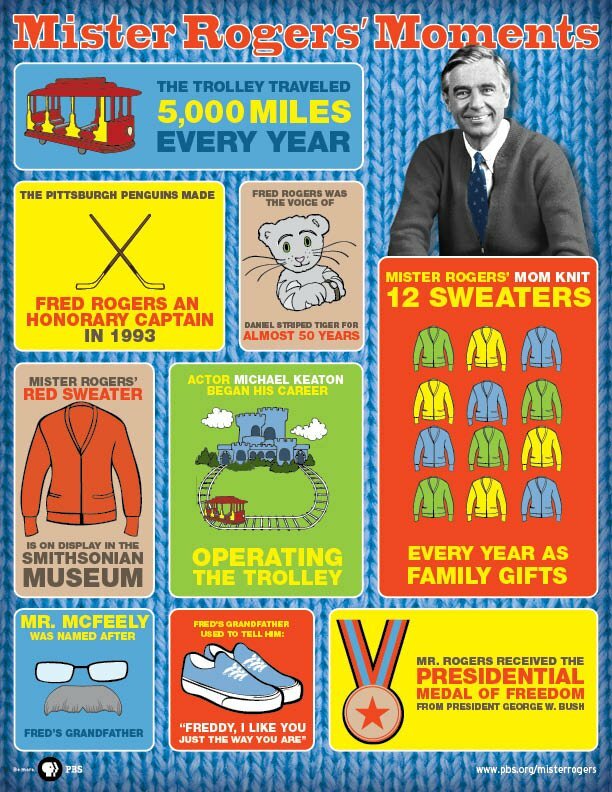 · The Mr. Rogers’ website is full of activities and games. Remember the stop light game? And of course you can allow kids (and adults) to create a puppet show. · Food: For the adults, I suggest kid-inspired food spiked versions of kids’ drinks. I’m thinking gourmet grilled cheese, adult milkshakes and some Rolling Rock beer – you know that Fred’s from Latrobe, which is also the hometown of Rolling Rock! · Music: Purchase some Mr. Rogers tunes here.